John Pinette is one of my favorite comedians. I have to admit, I have a similar skepticism of juicing. "Juice is not a verb." Another blogging-mom-friend (Marcy) recently started a juice fast as last ditch to attempt to recover her health. I'm not necessarily sold on juicing as a way of life, but I'm very happy she has found some relief from her pain. Living with chronic pain isn't easy. But following her story made a little light bulb go off above my head. All jokes about juicing a ham for Celia aside, having a juicer would definitely help broaden options for meals. While nutrition isn't an issue (she gets tube feeds of elemental formula), when you only have two foods to work with (pork and strawberries), creative presentation is the key to keeping food interesting. We've been using pureed strawberries for many things, but it's very labor intensive. Zapping them in a blender is easy; straining out all the seeds so you don't have crunchy gelatin is a royal pain. Plus, strawberry puree burns easily and means strawberry flavored candy tastes "kinda strawberry, kinda weird." Suddenly, I thought -- "Hey, I wonder if a juicing machine would make a difference." I'll give Marcy all the credit for juicer research. I went back to her blog to look at what she was using. She likes her juicer for hard fruits and veggies, but said it was not so ideal for softer produce. Since I wanted mine specifically for juicing strawberries, I opted for a model that has a "soft fruit" speed. The "package man" delivered it this week, and I set it up right away. Strawberries are FINALLY in season, so we are really gorging on them while we can! I pulled out a quart of strawberries and started juicing. I can sum up this machine in one word. AWESOME. 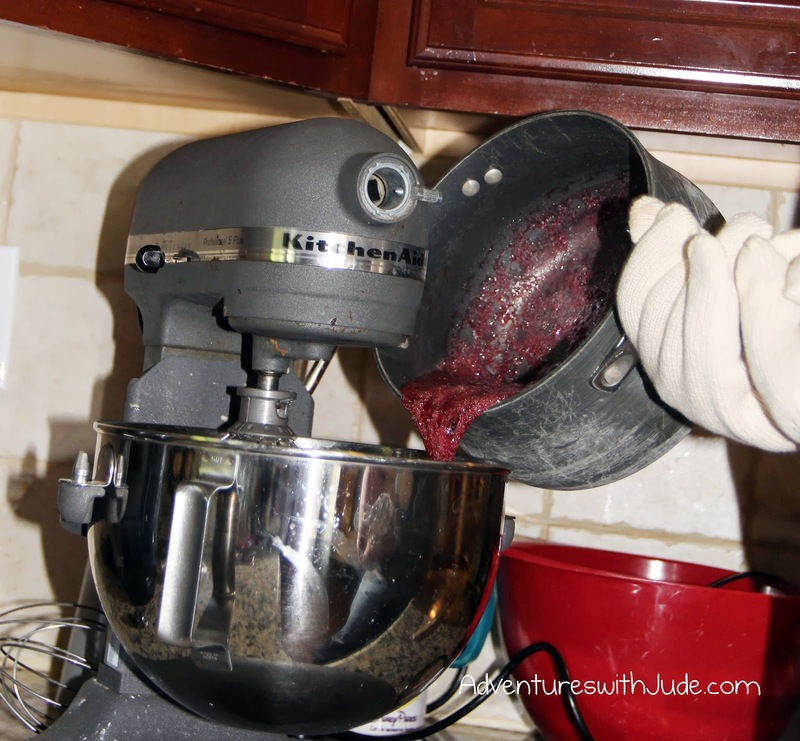 It made short work of the berries, and extracted almost 13 ounces of ruby-hued juice from a scant quart of berries. And there was not a single seed floating in it! I wouldn't say the pulp was bone dry, but when I tried to run it through the hopper again, nothing more was extracted. I switched out the pitcher for a bowl, and ran a couple of Granny Smith apples through it to make strawberry-apple juice for Damien. The pulp left from the apples was very dry - the consistency of damp sand. So yes, if there is juice to come out, this juicer wrings every drop! Celia drank a glass of strawberry juice with her dinner, and we used the leftover to make strawberry juice marshmallows. 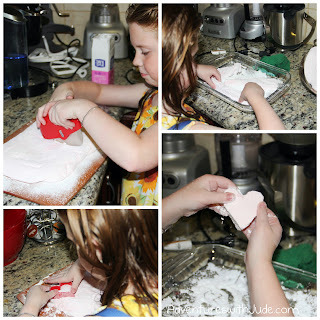 I've tried to make strawberry marshmallows before, first using berry puree (how we learned it burns). Then I tried making strawberry extract by macerating strawberries in rum. Despite a very strong flavor when I tasted the extract itself, that candy barely had a strawberry aroma. Celia and Damien love plain marshmallows (we go through two or three pans a week), but the I-can-outsmart-EoE side of me was on a mission to make strawberry marshmallows. I was hoping that the strawberry juice would do it. So Celia and I made marshmallows with the remaining juice. Verdict -- these are Strawberry marshmallows. Yes, with a capital S and italics. When I open the container, you can smell strawberries. When you bite the delicately pink marshmallow, you get a burst of berry on your tongue. Celia says they are perfect for a Princess Party. Or Valentine's Day. Or Lunch. I like them plain, and Celia likes them roasted. Damien doesn't care one way or the other -- just keep them coming! Note: You can use any powdered sugar. We purchase Tate & Lyle Icing Sugar from an online import shop. It's only sold in the UK, and it is pure cane sugar with no added starches. You can use any brand of "10x" or powdered sugar. This is a good project to do with kids, but a grown-up should do the thermometer and pouring parts. Line a 9x13 pan with (no-stick) aluminum foil. Sift powdered sugar generously, coating the bottom fully and the sides as best as you can. In a heat-proof mixing bowl, place 1/2 c. juice and gelatin. Mix to combine and allow gelatin to soften for about 10 minutes. If you're using a stand mixer, use the whisk attachment. In a small saucepan, mix remaining 1/2 c. juice with the granulated sugar. Over medium heat, melt the sugar into the juice, stirring gently. Bring to a full boil, place a lid on the pot, and set a timer for 3 minutes. DO NOT STIR THE SUGAR MIXTURE AFTER THIS POINT. You don't want to create any crystals that will make your marshmallows gritty. After 3 minutes, remove the lid. Carefully insert a candy thermometer into the syrup, and continue cooking until it reaches the soft ball stage (235* F). Carefully remove the pan from the heat. Start the mixer at low speed, and begin beating the gelatin mixture to break it up. Carefully pour the sugar syrup in, trying to avoid the side and the beater(s). DO NOT SCRAPE THE PAN - this can introduce crystals to the marshmallows. Just pour what comes out of the pan freely. Pour the marshmallow into the sugared pan. Gently scrape the sides with a spatula. You don't want to scrape the bowl clean (you may introduce crystals), just get what comes off easily. There will be a thin film of marshmallow that clings to the bowl. Coat the top of the panned marshmallow with powdered sugar. Gently press the marshmallow out so that it fills the pan and the top is mostly smooth. Allow to cool for 1-2 hours. Find volunteers to lick the spatula and beaters. There's never a shortage of those here. Lift the foil out of the pan, and turn the marshmallow over onto a cutting board. Gently remove the foil. Roll the cut edges in the powdered sugar to keep them from sticking. Store in an airtight container. Enjoy! 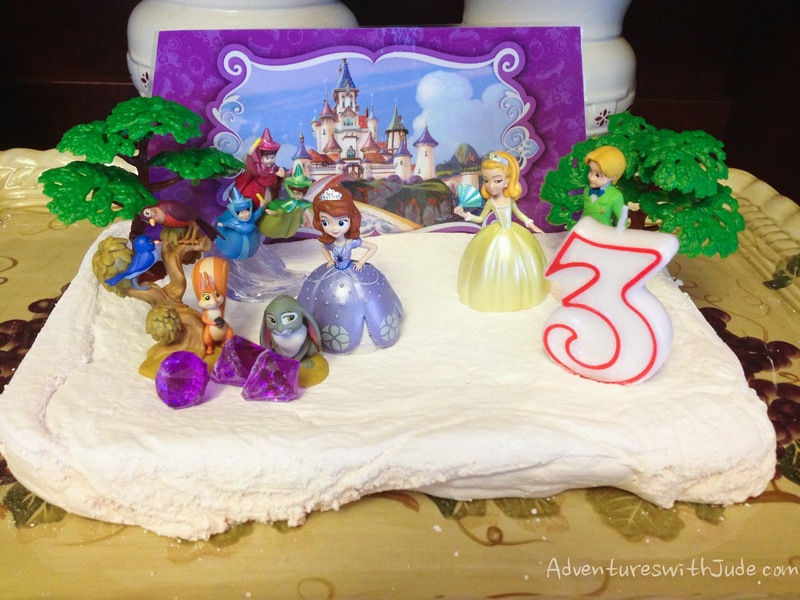 Here's an alternative for a fun, allergy-friendly birthday! Leave it uncut, and set cake toppers and a candle in it. This is Damien's birthday cake! oh that's awesome! We go through a lot of marshmallows here too! I like your recipe - it seems much simpler! Could you post your regular marshmallow recipe without the juice too? I use the same recipe, but use water instead of juice, and add 1 Tbsp of light rum in the last minute of beating (it works like vanilla - it's not "rummy" but it just cuts the sugar a little). Celia can have rum because it's a sugar product. Sometime I'd like to try making them with brown sugar to see if they come out caramel-y, but I always chicken out because I'm afraid the syrup will burn. Oh how wonderful! 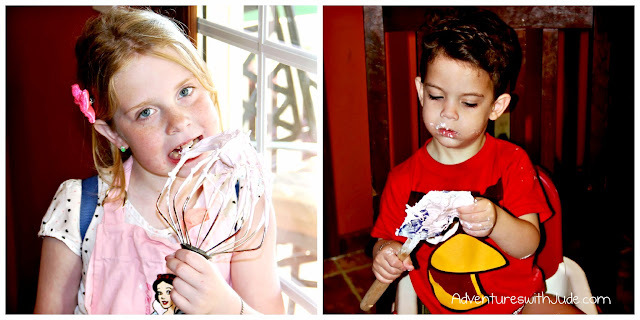 I've pinned and shared - thanks for linking up with Kids in the Kitchen! Looks awesome!! What kind of gelatin did you use? Plain old Knox -- last I checked, it is pork based so safe for us. This looks like fun! We have a juicer, so juicing the strawberries will be easy-peasy. And I have several marshmallow fanatics who will gobble these right up. Thanks for linking up over at Food on Friday! This looks wonderful. We have an old juicer my dad bought for me when I was 16. Let's just say that was over 20 years ago. We use it A LOT. It has made a difference in the health department. I'm going to try and make some marshmallows thanks to your post.